The air is colder, the tree branches are bare, and the CSA summer/fall season has come to an end. So it goes. When I showed up to the CSA last week, it was already dark (nightfall at 5pm! another sign of the season). 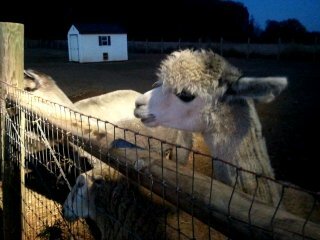 However, the llamas (and one of the sheep) were still out and looking determinedly cute. Two boys were busily feeding them grass. 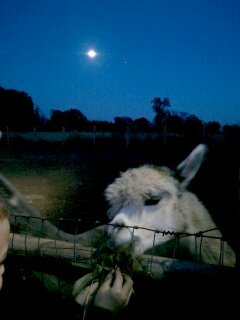 I do so enjoy hand-feeding llamas. They’re so happy when they’re fed. 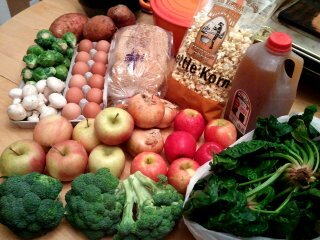 Last week’s penultimate CSA pickup included: kale, a head of cabbage, three broccoli crowns, three types of apples (eighteen total), white potatoes, carrots, a head of garlic, an acorn squash, and the usual eggs and bread (Great Harvest Swedish Rye). As I recall, we roasted the broccoli, made the kale into chips, made the cabbage into soup, and made glazed carrots. We’ve been steadily eating apples (one a day) for the past few weeks now. The squash and potatoes are still sitting around, but those can sit for ages. And then this week was the last CSA pickup. It was sad to say goodbye to the farm for the season! I’ll miss the friendly people and the cute animals. As an extra special thank-you from the farm, the pickup this week included a bag of kettle corn from Cacoctin Popcorn. 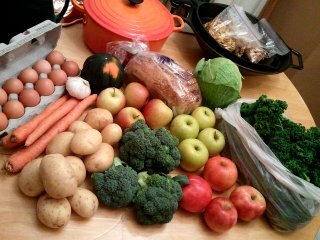 The rest of the pickup: a half gallon of apple cider from Baugher’s Orchard, sweet potatoes, brussels sprouts, mushrooms, apples (Fuji and Ida Red), onions, broccoli crowns, a pound of spinach, and the usual eggs and bread (Great Harvest sesame). …And that’s it for the year! It’s a bittersweet time, but at least we can look forward to Thanksgiving and the holidays. I’m already brimming over with recipes for baked goods.